"The Opposite of War Isn’t Peace…"
I’ve also started working on a couple larger projects. In looking around my place, I realized that I have painted/stained/stenciled several pieces of furniture in my living room – and I remembered that I really loved doing it and got a lot of satisfaction from it. My kitchen is so very tiny and I have no counter space so I decided a few weeks ago to go thrift shopping in hopes of finding a small table that would suit. 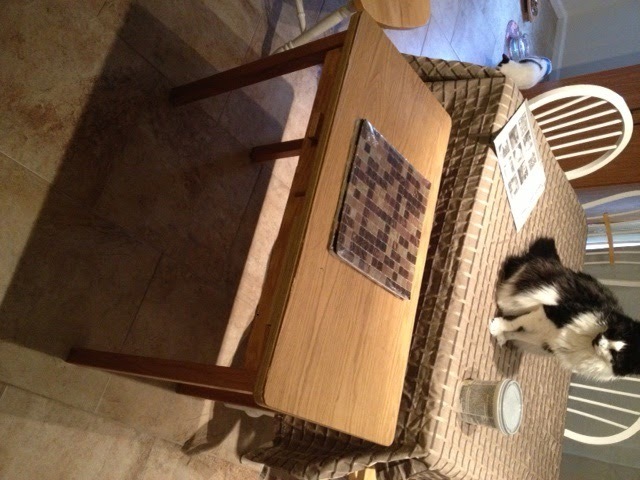 What I found was a $10 table at the Salvation Army…and the inspiration to make it really special. Not sure why this is rotated wrong but you get the picture. 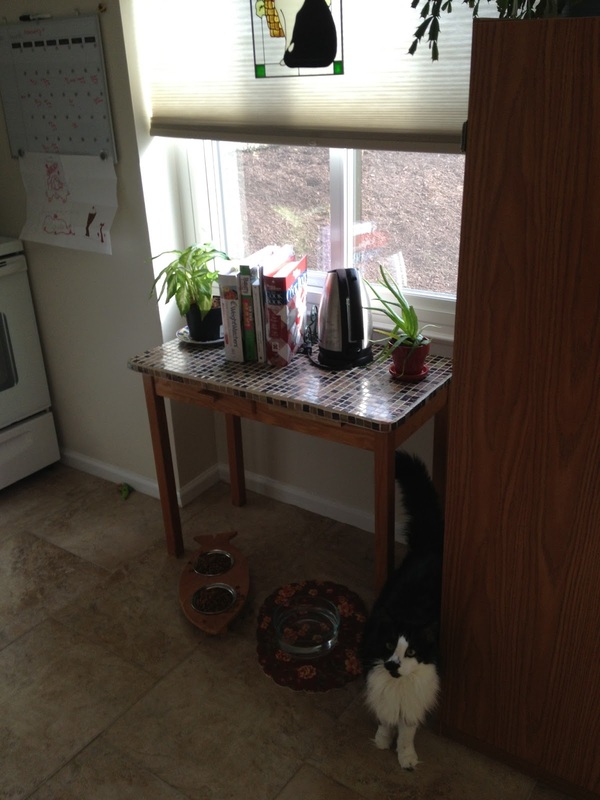 My feline assistant is looking at the table and wondering what the heck I am up to now. 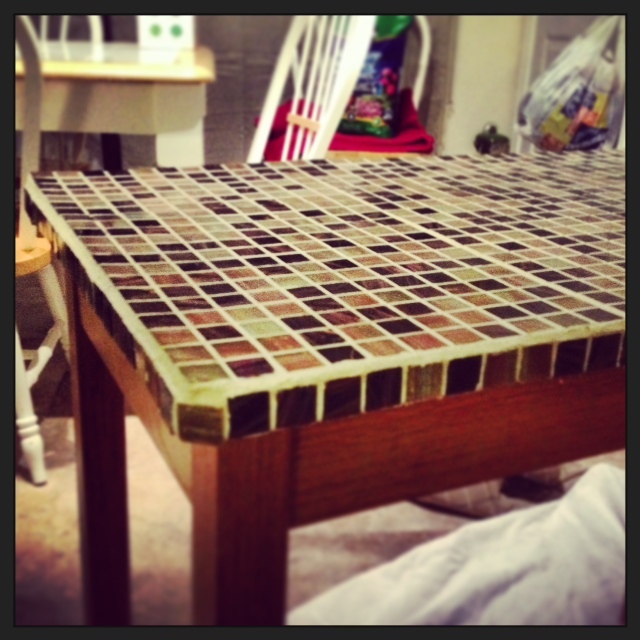 The table top itself had some cracked and bubbled laminate so I decided to tile it. A friend recommended I buy the tile with the mesh backing and another recommended I purchase grout/adhesive mix. Armed with these ideas and some help from the internet, I was off to the home improvement store to gather my supplies. I really love the look of this glass tile. 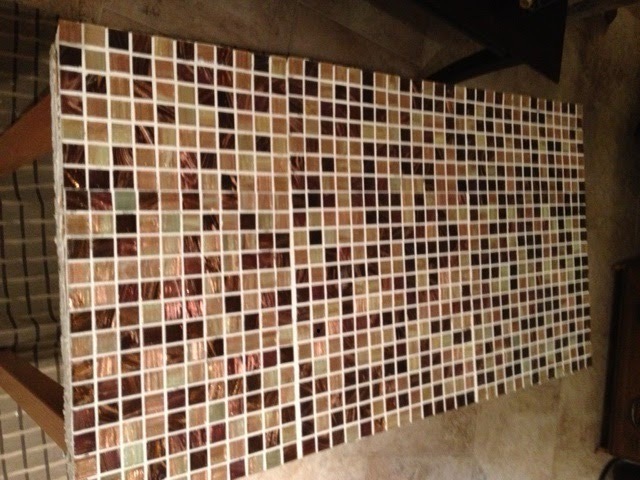 First step was measuring and cutting the tile to fit. 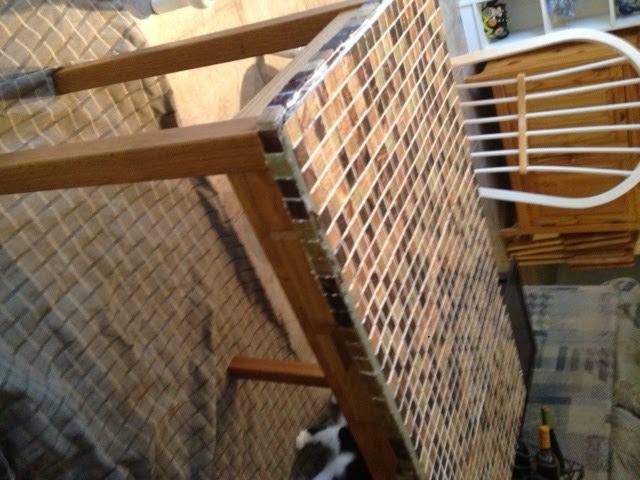 Then, I applied the grout/adhesive to the whole top (no need to sand since I was slathering it on) and applying the tile. I waited about 36 hours before applying the top grout. 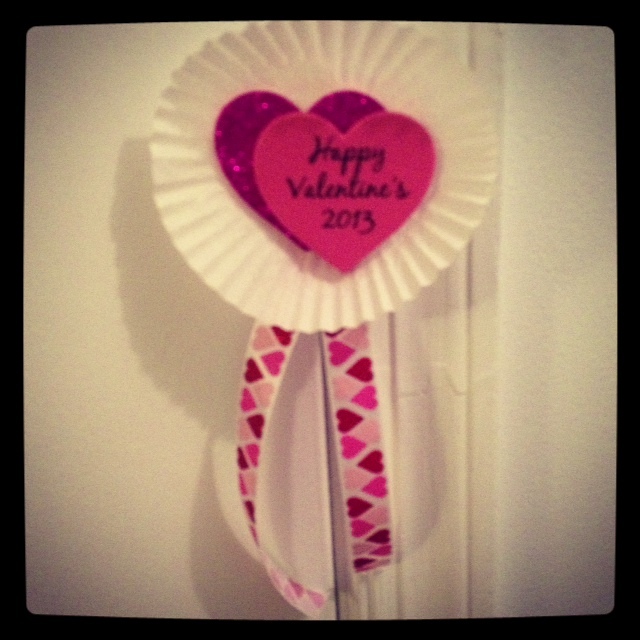 This took some work but was much easier than I would have anticipated…and a little messier. I had grout all over the place. 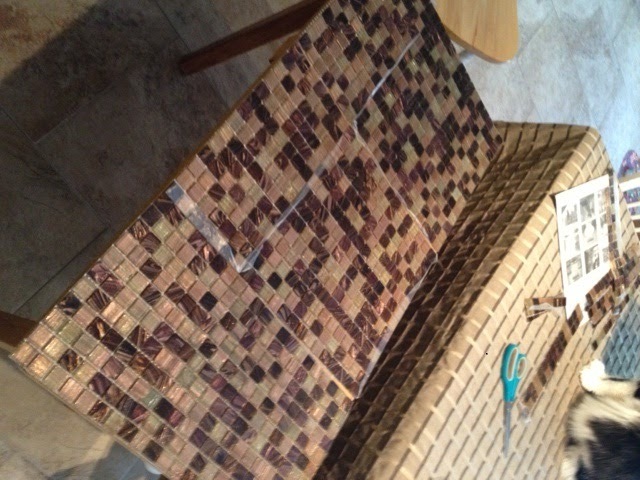 And so I decided to tile the sides as well. Gravity was not my friend on my first attempts. I waited a few weeks and then ended up glopping it right on to the back of the tile/mesh and pressing it on. It stayed! 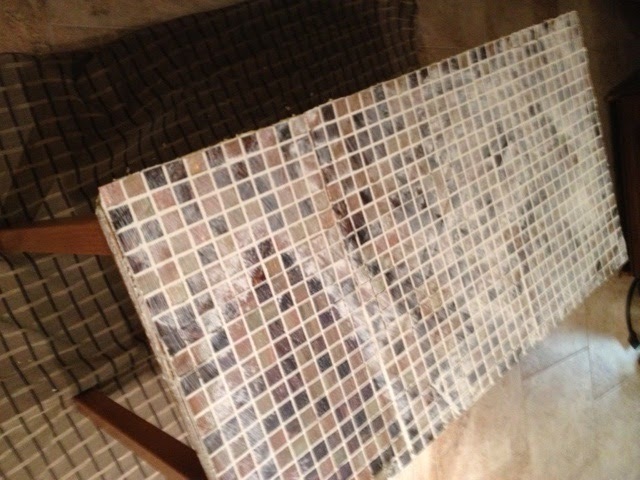 I wasn’t sure how it would look because of the glopping…but once I grouted it, I was really pleased! I’ve got a few new projects forming in my brain right now. One of the “benefits” of being a new girl in town is that I don’t have too much going on…so I have time to work on creating some pretty cool things. 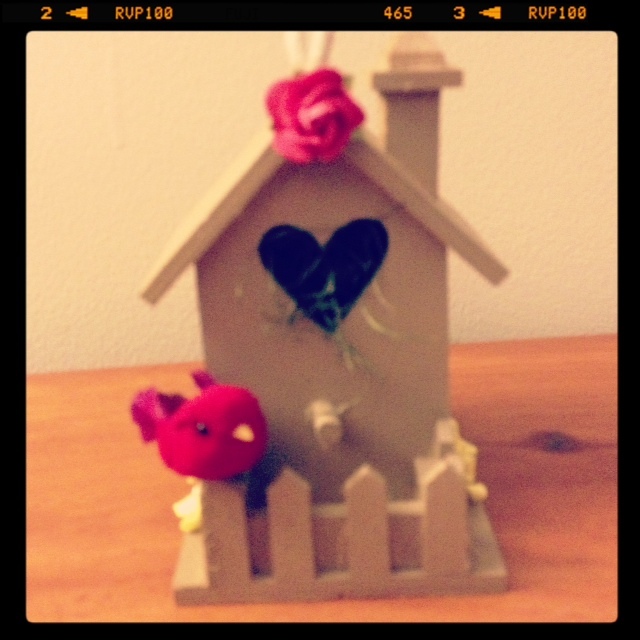 And I’m thankful to be reminded of my inner craftiness! ← Who Do You Think You Are, Anyway?